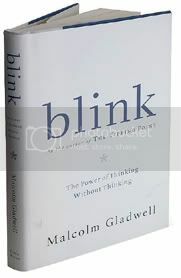 I've spent the last few days reading Blink and The Tipping Point by Malcolm Gladwell. I started off a bit skeptical about Blink - the overall statement it was suggesting seemed a bit obvious - if you are an expert in something, trust the decision made by your highly trained unconscious mind, your instincts; if you're not an expert, don't trust your instincts, because your mind is flabby and untrained, and your unconscious mind doesn't know what the hell it's talking about. "the disturbing this about this test is that it shows that our unconscious mind may be utterly incompatible with our stated conscious values.... We live in North America, where we are surrounded every day by cultural messages linking white with good. "You don't choose to make positive associations with the dominant group," says Mahzarin Banaji, who teaches psychology at Harvard University and is one of the leaders in IAT research. "but you are required to. All around you, that group is being paired with good things. You open the newspaper and you turn on the television, and you can't escape it." "It's not going to affect what you'll choose to say or feel or do. In all likelihood, you won't be aware that you're behaving any differently than you would around a white person. But chances are you'll lean forward a little less, turn away slightly from him or her, close your body a bit, be a bit less expressive, maintain less eye contact, stand away a little further, smile a lot less, hesitate and stumble over your words, laugh at jokes a bit less. Does that matter? Of course it does. Suppose the conversation is a job interview. And suppose the applicant is a black man. He's going to pick up on that uncertainty and distance , and that will make him a little less certain of himself, a little less confident, and a little less friendly. And what will you think then? You may well get a gut feeling that the applicant doesn't really have what it takes, or maybe that he is a bit standoffish, or maybe that he doesn't really want the job. What this unconscious first impression will do, in other words, is throw the interview hopelessly off course." And I'd never considered that, and so it puts my whole "it's what you do that counts" idea into doubt. What we do is harder to control than I thought. I ended up enjoying Blink so much that I immediately bought The Tipping Point, which is about seeing the spread of ideas and trends as spreading like epidemics. I really enjoyed this one too. It's similarly fun to read, associating things that you would never normally associate. And it pleased me to think the only thing stopping my stories from taking over the conscious minds of the world is maybe the lack of a good maven and salesman. 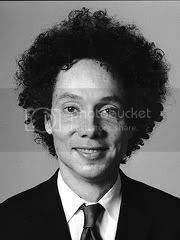 I think Malcolm Gladwell is one of the top essayists of our times. It takes a little while to get into him, but it's well worth it--he has a lot of good things to say. No, I haven't finished Blink yet, but I hope to soon.